No objection certificate – known more commonly as NOC in short – is an important official document which provides authority or permission to an individual or organization to perform a certain task. It is a legal certificate issued by relevant agencies or individuals. For instance, a No Objection Certificate is required to get permission from the government to construct a building. A NOC may also be requested by an employer while switching to another job. It, therefore, carries immense importance for different types of legal tasks and procedures. What is no objection certificate? No objection certificate is used to certify that the writer of the certificate has no objection on what he is writing. However, it should be ensured that whatever written in the certificate is legal and concise. There are many situations when an individual is required to submit a no objection certificate somewhere. For example, many organizations ask their newly recruited staff members to submit the no objection certification written by their previous employers. Students are also required to provide no objection certificate when they want to switch from one educational institution to another. Like all other types of legal certificates, a No Objection Certificate follows a specific format. For this purpose, the Certificate Templates are available which can be used by an organization or individual upon request by someone. In general, the certificate consists of a precise written description of the purpose of the specific NOC. It includes the name of the agency granting the certificate as well as that of the individual or organization receiving it. In a template, the spaces for names and signatures are left blank. Many copies of a single template can be printed to be used whenever needed. 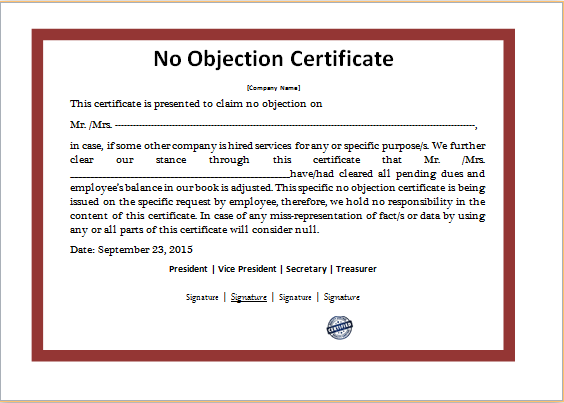 Using a No Objection Certificate template saves a great deal of time. Copies of the template can be made and used whenever required. Individuals can either make modifications to this template or use it as it is according to their specific needs. NOC templates for different purposes are available on the internet. Agencies can download and print the templates and use them without any hassle. The no objection certificate (NOC) is a very useful document for those people who want to prove that they have no link with the previous job anymore. The submission of no objection certificate also saves the organization from many legal disputes in future. Some organizations also use this certificate to ensure that the employee does not work in two organizations at a time when he is committed not to do so. No objection certificate (NOC) is very commonly used document that everyone needs once in a while. It should be kept in mind that it is the responsibility of the employer to issue this certificate to the employee when he leaves so that he can easily get job anywhere else. This certificate is a clear indication that the certificate holder has got permission from seniors and authorities to do what has been mentioned in the certificate. If you are running an organization and someone asks you to submit the no objection certificate, it would be very time taking for you to make a certificate from scratch. You can simply download the NOC template available here and save yourself from the hassle of creating the certificate. NOC template also saves the user from having to think about the format since it is already designed in a professional looking format. However, if the user finds something inappropriate in the form and wants to omit it from the certificate, the template will allow him through its customization feature.